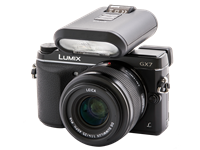 Panasonic has clearly put a lot of effort into making the DMC-GX7 a very enthusiast-friendly camera, although it's still made it very accessible to the less experienced user. If you want seven customizable buttons and three spots on the mode dial for your favorite settings, they're all yours but there's enough redundancy that you don't need to customize everything in order to get at the setting you want to change. 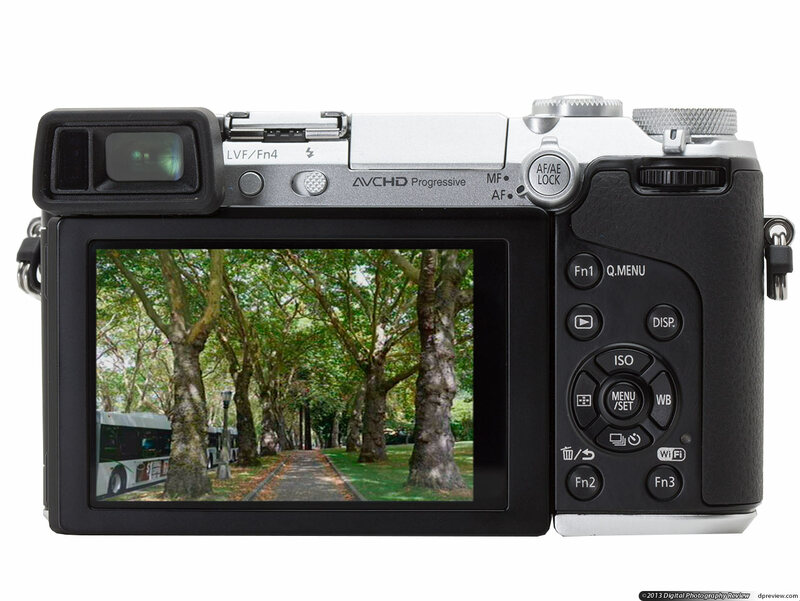 There's also the same 'make-the-decisions-for-you' iA mode that Panasonic offers to users wanting to simply point-and-shoot. In addition to all the customizable buttons, you can place the histogram anywhere on the frame, which comes in handy when it's blocking your subject. You can also see the dual-axis electronic level in this screenshot. 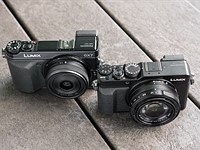 There are two ways in which you can control the GX7. There are the traditional buttons - concentrated mostly on the rear panel, to the right of the LCD - plus the touchscreen LCD. You can shoot exclusively with the buttons, but the touchscreen provides some useful additions. The four-way controller has direct controls for ISO, white balance, focus point selection, and drive mode. The center button enters the menus or confirms your selection. 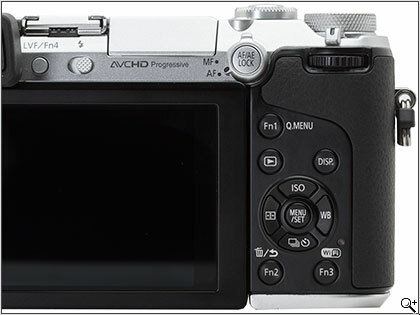 Above the controller are buttons for entering playback mode or toggling what's shown on the EVF and LCD. The remainder of the buttons that surround the four-way controller are customizable. By default, Fn1 enters the Quick Menu (described below), Fn2 deletes photos and backs out of menus, and Fn3 activates the Wi-Fi feature. There's also Fn4, which normally toggles between the LCD and EVF. If that's still not enough, there are also three 'virtual' buttons available on the touchscreen. This screen is the jumping-off point for customizing the nine function buttons on the camera (four physical, five on the touchscreen). The options are the same for all of the buttons. Here are the options available for the four physical Fn buttons. the options for the touchscreen buttons are virtually the same, with the exception of the options marked with an asterisk. If you really want to customize the button layout, you'll be thrilled to hear that you can store up to five sets of Function button layouts by using the three 'C' spots on the mode dial. 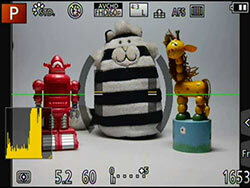 There are two ways to easily access the most important settings on the camera. 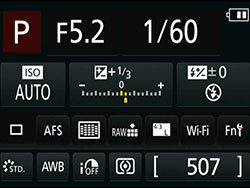 The first option is to use the Quick Menu, which has been a feature of Panasonic cameras for a very long time. 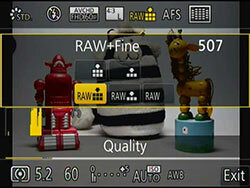 The Quick Menu has a preset selection of options, which line the top and bottom of LCD or EVF. The other is a customizable version of the Q.Menu (you can choose between the two in the Custom menu). At left is the preset Quick Menu, which can be navigated with buttons or your finger. The menu runs above and below the field-of-view in this mode. On the left is a customized Quick Menu, which runs along the bottom of the screen. Creating your very own shortcut menu, once you've engaged the Custom Q.Menu option, requires a little drag-and-drop. To add an item to the customizable Q. Menu, just drag it from the bar on the bottom to the section above it. To remove an item, do the opposite. There are ten slots for icons, ranging across two pages, and 26 options that can be slotted into them. While there aren't as many options available for the Quick Menu as there are for the Fn buttons, nothing important has been left out from the 26 choices. 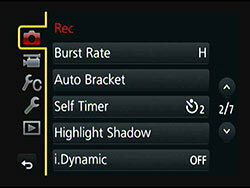 Another method for quick setting adjustment is via the 'recording information' screen. This screen is designed to be shown when you're using the electronic viewfinder, and it shows virtually every major camera setting. Given the fact that the GX7 has a touchscreen, it should come as no surprise that you can touch on the displayed settings to adjust them. The rec info screen, which you can see by pressing the Disp. 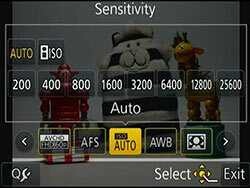 buttons a few times, shows exposure information and commonly used settings. You can adjust almost all of the settings (save for exposure info and shots remaining) by tapping them with your finger. Doing so takes you off to another screen - you can't just tap and turn the dial. While the GX7 offers a lot of customization (though no more than we've come to expect from Sony and Olympus models at this level), there is at least one feature missing - the ability to choose which display screens you want in live view mode. This means that, if there are two levels of information you like, you have to cycle through them all to get to the ones you want. For the full selection of camera options you'll need to head into the main menu. The menu is divided into five tabs, covering record, movie, custom, setup, and playback options. We'll get into the most interesting features found here later in the review. The recording tab is one of five in the main menu. When you select one of the menu items, a description of it is displayed at the top of the screen. 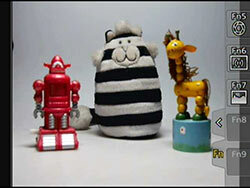 Like the Quick Menu, the main menu can be operated with buttons or fingers. It's smooth and easy to navigate regardless of how you're operating it. Most of the options are fairly obviously categorized, so it shouldn't require too much hunting. Since it's been mentioned several times throughout this review, you've probably figured out that the GX7 has a touchscreen LCD. Above you saw menus which can be operated with a finger - but what else can you do? The first two touch-related features are pretty obvious: you can tap the screen to focus or take a photo. In playback mode, you can swipe from photo to photo, and double-tap to zoom in and scroll around. If all of the menus described above weren't enough, there are two 'tabs' on the right-hand side of the LCD than you can open. The first tab has control for using a power zoom lens, turning on the 'touch photo' or 'touch AE' features or engaging focus peaking. To access the five on-screen function buttons discussed further up the page, open up the lower tab and you'll find them. Perhaps the coolest touch-related feature is called Touch Pad AF (engaged under 'Touch Settings' in the Custom menu). With this feature on, you can use the touchscreen to select the focus point while you're looking through the electronic viewfinder. Touching the LCD panel doesn't really work on most cameras but, particularly if you flip both the screen and EVF upwards, it becomes pretty usable. The Touch Pad AF system has two options - Exact and Offset. In Exact mode, you tap in the position on the LCD screen where you want to focus - in Offset mode the movement is relative to wherever the cursor is currently positioned. One problem with Touch Pad AF is that it really isn't suitable for left-eyed shooters - they'll be using their nose to select the focus point, rather than their finger. When using the DMC-GX7, you sometimes get the feeling that Panasonic went a little too far, throwing every possible feature into the camera. If you're using it with default settings, then everything is pretty straightforward, with logically laid-out controls, and an easy-to-use touch interface. 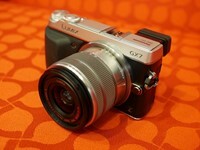 The camera is easy to hold, and the GX7 felt 'just right' in my hands. Things get more complicated when you start to customize those nine buttons. This reviewer found that it was difficult to remember which function was mapped to a given Fn button, which resulted in some trial and error. This will probably get easier as more time is spent with the camera. The on-screen function buttons are easier to use, as they show you exactly what feature you're adjusting. There was one button that I wanted to redefine right away, and that's the one which enters Wi-Fi mode. It's a feature that takes a while to load - locking the camera while it does so. After pressing it accidentally on several occasions, and waiting for the feature to load (so I could back out of it), it was time to map another function to it. While out shooting, the LCD was my preferred method of composing photos. 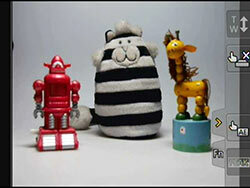 Besides the obvious increase in size over the EVF, it's also easier to see outdoors. As mentioned earlier in the review, the relatively small finder eyecup means there's quite a bit of light leakage around the EVF (especially when you're wearing glasses), which required me to shield it with my hand so I could see anything. Since the EVF uses field sequential technology, I found the 'rainbow effect' to be very hard to look at, which was another reason why I usually relied on the LCD. I also struggled to figure out the purpose of the tilting EVF. If I want to compose photos from above, I've got a nice big LCD to do that on - and it tilts down, too. Still, there are likely some photographers who prefer using an eye-level finder who will appreciate this feature.